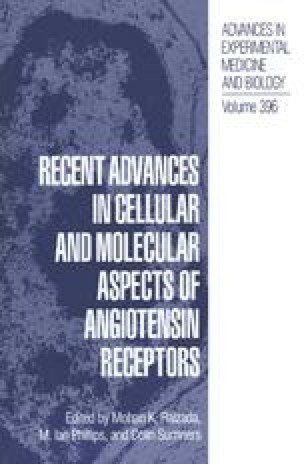 Angiotensin II (Ang II) has multiple physiological effects in the cardiovascular, endocrine, and nervous systems that are initiated by binding to specific receptors located on the plasma membrane (1). Two major subtypes (type 1 and type 2) of Ang II receptors have been revealed by their differential affinity for nonpeptide drugs (2). Ang II type 1a receptor (AT1a-R) cDNAs have been cloned from rat vascular smooth muscle cells (3), bovine adrenal zona glomerular cells (4) and rat kidney (5). Ang II mRNA is expressed in a variety of cells and tissues including vascular smooth muscle cells, liver, kidney and spleen, while the mRNA abundance is low in other tissues such as heart, brain, thymus and testis. AT1a-R gene expression is regulated in an ontogenic manner (6). Thus, the rat AT1a-R gene is cell-specifically and developmentally regulated.